Photos often tell more than a thousand words can say. This book is an illustrated history of the North American Aviation production plants at Inglewood and Kansas City and the assembly lines of the B-25 Mitchell. Both plants produced the B-25 medium bomber during World War Two. The book tells the story of the plants and give an impression of the factories and the thousands of employees that worked every day in shifts to produce one of America’s finest airplanes. Many photos give the atmosphere of working in the factories and doing the tremendous job of producing nearly 10,000 examples of this great bomber. The workers in these factories were tens of thousands of men and women. They were the unsung heroes of World War Two, producing the airplanes. 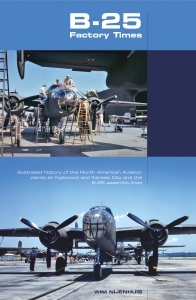 This book also gives a brief overview of American aircraft production during the Second World War, which countries operated the B-25s produced, and information about B-25 promotion, test pilots of the first flights and the ferrying of the new aircraft to the operational areas.